3D printing is an exponential technology and poised to radically shape our man-made environment. The same change that resulted from the introduction of the personal computer just 20 years ago will be realized again with 3D printing. Will you be ready? The book is broken down into 5 sections. In the introduction, I quickly review the history and a quick explanation of the technology as well as listing several ways 3D printing is being used today. The second chapter is for 3D designers and those interested in learning how to become one. I’ve cover the different software choices, the expected salaries, places to sell your designs, and the opportunities for freelancing. 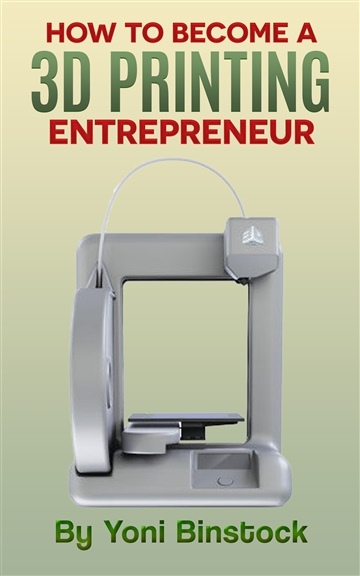 The third chapter focuses on individuals who have or who are looking to purchase a 3D printer. The section will cover the different models, how to lease out your printer for extra money, and the different objects you’ll be able to print. In the fourth section, I feature many of the other fields where you can earn money in 3D printing including: materials, spare parts, scanning, software, teaching, and much more. After the conclusion, there is a list of over 50 resources plus words of wisdom from other 3D printing entrepreneurs. They are world renown artists, CEOs of startups and of well established companies, successful freelancers, and many others inspiring entrepreneurs.